Fishing is a very simple and straightforward skill that involves, you guessed it, catching various fish. Even though it's arguably one of the easiest skills to level up, experience rates are quite slow compared to other skills of similar caliber. You're best off training it as an auxiliary while you do something else whether it be watching TV in real life or playing a different game in another window; if you just focus on yourself fishing and nothing else, you might go crazy. Catches not listed in this guide are obviously not recommended if you are looking for the best experience per hour, as the optimal methods involve limited types of fish. It goes without saying that you can train cooking effectively as you level up fishing. With this guide, 99 fishing will give you the materials for 99 cooking too. The best place to get shrimp is in Catherby, or in Draynor Village if your combat level is high enough (15+) for the Dark Wizards roaming near the fishing spots to not attack you. Check the Beginner's Guide page on how to get over White Wolf Mountain. New accounts always start with a small fishing net, so you don't need to buy any equipment for this. You need to catch approximately 52 shrimp to level up to 10 fishing, which is less than two full inventories so this will go by quickly. Once at level 10, you'll be ready to move on. Once at level 10, you can start gathering items needed for the very easy Fishing Contest quest. If you were already in Catherby when you got your shrimp, you can start it faster than if you were at Draynor. Head over to its guide for more details. Once you've completed the quest, you will be leveled up to 23 fishing! Now you can begin fly fishing trout (you cannot catch salmon until level 30), which will require quite a bit of feathers and a flyfishing rod (can be bought from Port Sarim, Catherby, or Piscatoris). In order to get a lot of feathers you can either buy them from other players, or from various fishing stores where they're sold for 2 gp each. These stores are in Port Sarim, Shilo Village, the Shantay Pass, and the Fishing Guild - they all stock up to 1,000 feathers. The best place to flyfish is in Shilo Village (unfortunately requires its quest to get in), followed by the Barbarian Village+banking at Edgeville. If you don't care about cooking you can powerfish by dropping your catches as your inventory fills up, this is better fishing experience per hour but is not recommended as trout/salmon make for good all-purpose cheap food. From level 23, it will take around 63 trout catches to reach level 30. Once you are level 30, you will begin to catch salmon as you continue flyfishing along with trout. Now that your catches are random between salmon and trout, gauging the amount of each catch until level 60 would be wildly inaccurate but at this point flyfishing has a very good experience rate so it'll go by fast enough. Remember the tips and locations from earlier as well. This is where the rates start to get quite good. You can start fishing lobsters with a lobster pot (buy at any fishing store) in Catherby. Once you hit level 68 (or level 65 with a Fishing Potion), you can switch over to using the Fishing Guild north of Ardougne which has spots even closer to a bank. From level 60, it will take approximately 8,456 lobster catches to reach level 80. You'll be sticking with memefish from here on out, which require a small fishing net to catch just like shrimps did - you've come full circle! 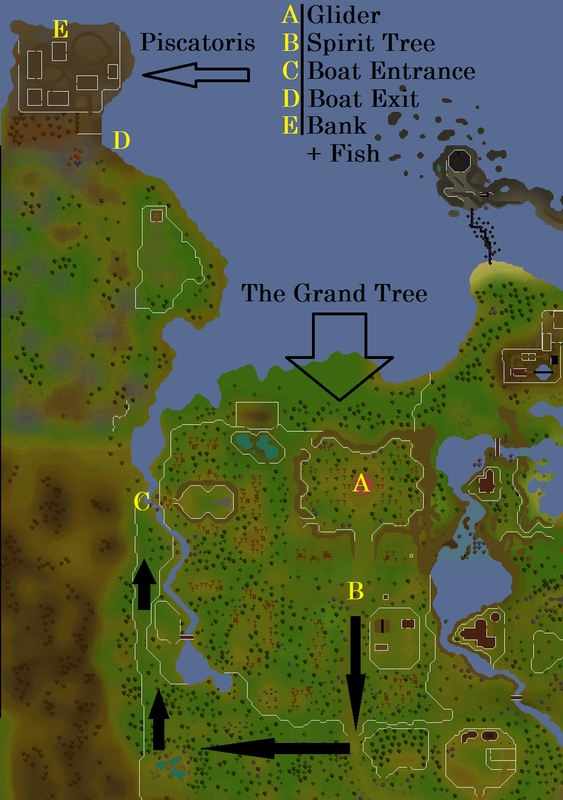 In order to get to Piscatoris to fish them, you must walk around the outside of the Tree Gnome Stronghold to reach Kathy Corkat whom you must pay 50 gp (or 0 gp if you charm her with the Ring of Charos (a) - requires completion of Creature of Fenkenstrain and one step into Garden of Tranquility) to get rowed over to Piscatoris. The fastest way to get there is to glide or use a spirit tree to reach the Grand Tree, assuming you've done those transportation types' requisite quests. Once Kathy has taken you to Piscatoris, there is a small hole in the ground near her boat that you can crawl through (does not require any agility levels) to then enter the colony proper. Head north from there where you'll reach Arnold Lydspor who will be your banker and then north of him are the monkfish fishing spots. Not much else to say at this point; like I said before, fishing can get boring on its own so good luck. Starting from level 80, it takes about 40,920 monkfish to reach level 99! Q: Why fly fish instead of fishing lobsters once you each level 40? A: At the bare minimum requirement to begin fishing lobsters, their experience rate will be incredibly slow. At that point you probably won't have a high enough cooking level to not burn lobsters as much/at all either, so it's best to stick with fly fishing until your fishing and cooking are high enough. Q: Why not stick with fly fishing until 80? Isn't it faster? A: Lobsters are only bad experience if you fish them straight from level 40, but at level 60 their experience rate surpasses flyfishing without the need to use feathers and with better cooking exp too, making them superior. If you have a bit of leftover feathers by all means use them, but if you have quite a lot then it may be best to save them for something like fletching arrows. Q: Why not harpoon for tuna/swordfish? A: Again mentioned in the introduction, harpooning isn't recommended as swordfish are just barely better than lobsters are in terms of healing, and by the time they become better than lobsters for exp you should be fishing monks anyway. Tuna are even worse for food, their only advantage is that they can be used to make tuna potatoes which are the best single-click healing item in the game (22hp) but they require a lot of other ingredients (sweetcorn, butter, etc) and are a hassle to make so sharks should serve well enough. However it is your choice if you really want the best food. Q: Why not lobsters till 99 or monkfish from 62? A: The same reason why you switched over from flyfishing to lobsters, once you hit level 80 the experience rates become superior to the previous fish. Monkfish right from 62 are also incredibly slow, moreso than lobsters right at level 40. Q: You can just go to Piscatoris at any time? A: Yes, since Swan Song isn't available yet you can always enter and exit as you please just like most other quest-end features. A: Sharks are absolutely garbage for fishing exp. Not only do they give worse exp per catch than monkfish, but they also take over twice as long per inventory. Their only advantage is that they heal more (20hp compared to 16hp), but if you're just looking for food it's better to buy from another player instead of wasting time fishing them yourself - even at level 99, they are incredibly slow. Don't even consider starting sharks at 76 either, I will personally hunt you down and REEEEEEEEEEE at you for being so inefficient. If you ever decide to catch sharks (hopefully at least at level 98 or so), the Fishing Guild is the best spot for them. In conclusion, fishing is a decently profitable skill that's comfy to grind. You will accumulate a ton of fish on your road to 99 which will no doubt certainly allow you to 99 cooking as well. However due to the abundance of players fishing and cooking, if fishing just for food is what you're after then that may not be needed as there will always be someone selling them. It is your choice either way though, there's nothing stopping you from wanting to level up a bit and there's always quest requirements that need fishing and cooking levels too. Here's hoping the grind is enjoyable either way! If you have completed this guide, congratulations! If you're just passing through, thank you for reading!